I'll accept your sweet comments until midnight Saturday January 31st. GOOD LUCK! Well lookie here! See that red arrow pointing to a really cute mini album? That's MINE! 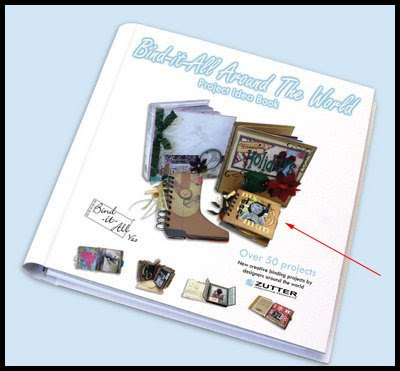 Zutter is publishing a brand new book of ideas for the Bind It All that's being launched at CHA in Anaheim. My album was chosen for publication several months ago, but I only found out this week that it made it onto the cover. This is only the second time that a project of mine has been featured on the cover of any publication, so I'm pretty excited. Just wanted to share my happy news! It's a new challenge at Caardvarks! This time it's a full-on epidemic...we're seeing spots!! 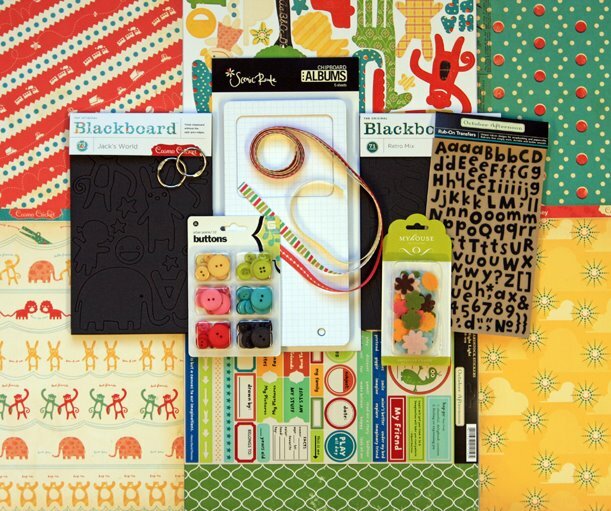 That's right, make your best cards featuring POLKA DOTS and load them up to our Flickr Gallery by midnight on February 3rd to be eligible to win the gorgeous February kit by My Scrapbook Nook. The kit is loaded with delicious products from Jenni Bowlin (as well as a few others) which I have been savoring for the last few weeks. You'll really love them! 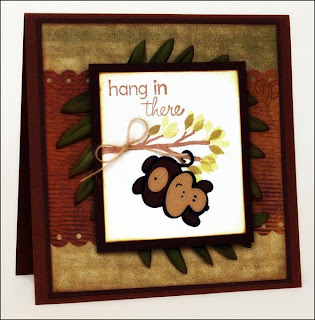 This card is extra special - it's for my best scrappy buddy, Carolyn! Her birthday is just over a week away, and I used this chance to get her card made a little early and wrapped up with her birthday goodies. Be on the lookout for this in the mail soon, C! ♥ Details for this card are here. 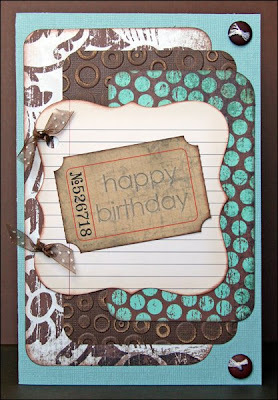 It features Dream Street papers, Jenni Bowlin label shape (uh huh, I told ya) and a Tim Holtz ticket. Mmmm. The other card is finding its way to my cousin by marriage, Michelle. 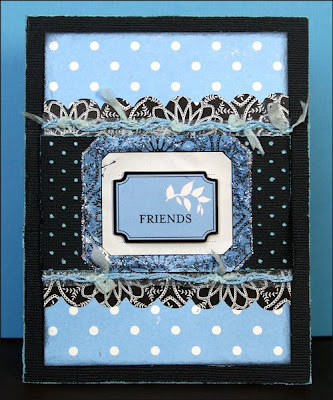 It's got lovely shades of blue and black from the Making Memories 5th Ave. Sophia line, very classy just like Michelle. Details for this card are here. Can't wait to see you polka your way into this challenge! Here is a fun wooden shape I altered several weeks ago from the fabulous Say It With Letters online store. The MDF shape comes smooth as butter, keyhole drilled in the back for easy hanging if that's your choice. I used crackle medium on my woodsy buddy as well as those awesome feathered patches as wings. Some layered flowers with brads for eyes and a handcut beak finished this project. 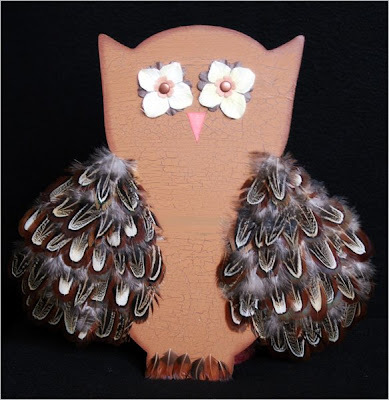 Be sure to check out two other styles of owls by SIWL DT members Robyn Weatherspoon and Julie Masse. Julie also designed this shape for the store - how cool! You can purchase this awesome owl shape by clicking here. Enjoy! 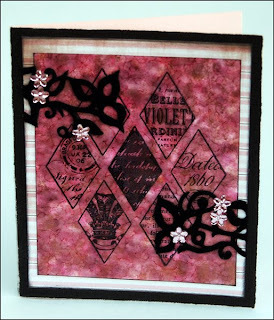 Here's a catch up post with some projects I created using Purple Onion Designs stamps. The first one has my favorite Pink Paislee line called Vintage Moon with the Thank You Noteblock stamp. I also embossed Core'dinations cardstock with a Cuttlebug embossing folder (one of my latest obsessions). This little matching combo uses their Halloween Doodles stamp set. 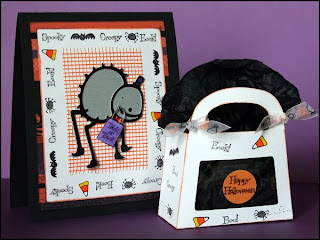 I did lots of stamping then used my Cricut to create the cool spider and treat bag. The tiny treat bag in the spider's mouth was stamped - I created a wire handle for the bag, too. The window in the treat bag is a transparency. I love how this card turned out! I made the background with Ranger alcohol inks and copper mixative on glossy paper. The Purple Onion Harlequin stamp was stamped right over the top with StazOn ink and layered with fun Queen & Co. felt and some bling. The last project was so fun. I used the Hang In There set which doesn't come with any bird or critter for on the branch. Instead of mixing stamp companies I simply used a die cut Cuttlebug monkey and slit the stamped piece so that his tail would lace right through. My friend Di Hickman had this on her blog, so I'm playing along. Here's a list of 100 activities: mark in bold the ones you have done, and italicize five you would like to do most. If you want to participate, just snag and post to your blog! 1. Started my own blog – Hello, you're here! 3. Played in a band – Which kind, in which state? The answer is YES, many!! 4. Visited Hawaii – No but I'd love to. 6. Given more than I can afford to charity – I give my fair share to charity, especially for things at church. 7. Been to Disneyworld/land - October 2009 is my first trip!! 8. Climbed a mountain – I grew up near the Poconos, so yes. 10. Sung a solo – With two music degrees? Sure have! 11. Bungee jumped – no, not sure I would either. 13. Watched lightning at sea – We saw a cool storm over the ocean in the Bahamas this summer. 14. Taught myself an art from scratch – Do alcohol inks count? How about Photoshop? 15. Adopted a child – No, but my goddaughter is adopted. 16. Had food poisoning – Something from Red Lobster in Nashua, NH. I get goosebumps just thinking about it!! Ugh. 19. Seen the Mona Lisa in France – Sure did! The guards kept yelling at people to turn off the flashes on their cameras. 20. Slept on an overnight train – Nope. Does a ferry across the English Channel count instead? 21. Had a pillow fight – Good Lord, yes! 22. Hitchhiked – No way! 23. Taken a sick day when you’re not ill – It's called a MENTAL HEALTH DAY, thank you. 24. Built a snow fort – We have home movies of us as kids making an igloo/fort out of the snow my dad plowed from in front of our garage. 28. Ridden in a gondola in Venice – Almost did in Vegas! 31. Hit a home run – Most likely not. I am not very athletic. 33. Seen Niagara Falls in person – Yes, and it's incredible! 34. Visited the birthplace of my ancestors – If you're counting Poland and Lithuania, then no. 35. Seen an Amish community – You can't live in Pennsylvania and NOT see one at least once in your life. 36. Taught myself a new language – My childhood friend Nikki and I used to make up our own version of sign language to talk in the middle of classes. 37. Had enough money to be truly satisfied – We are blessed to have what we need and enough left over to share at least some. 41. Sung karaoke – Sure! 44. Visited Africa – Nope. I can't imagine how many photos I'd take if I could. 45. Walked on a beach by moonlight – Yes, a long time ago. 46. Been transported in an ambulance – Thank God, no! 48. Gone deep sea fishing – No, and no interest either! 49. Seen the Sistine Chapel in person – I scrapped my inlaws photos, does that count? 50. Been to the top of the Eiffel Tower in Paris – Didn't get the chance when we were there. 51. Gone scube diving or snorkeling – No freakin way! 56. Visited the Great Wall of China – No, no real desire to either. 58. Taken a martial arts class – No, but I'm living vicariously through my son, Ian. 60. Served at a soup kitchen – Nope, but in college we did a lot of grounds clean-up work for one. 61. Sold Girl Scout Cookies – Nope, but I have bought my fair share!! 62. Gone whale watching – We talked about it often when we lived in MA, but we never got to do it. 65. Gone sky diving – For a long time I thought I would, but I think that bravery has passed. 66. Visited a Nazi Concentration Camp – nope, and no desire to. 67. Bounced a check – Nope, never. 68. Flown in a helicopter – I'm pretty sure that I have. More importantly, I want to be the one actually FLYING the helicopter!! 75. Been fired from a job – No, thank goodness! 78. Been on a speeding motorcycle - no, not really. I have ridden on motorcycles before, just not when they were speeding. 85. Read the entire Bible – No I haven't. At least not yet. 87. Killed and prepared an animal for eating – Heck no!! 88. Had chickenpox – 6th grade. I missed the Valentine's Day dance. It was supposed to be my first one ever. Can you tell I'm still bitter? 91. Met someone famous – I can't think of anyone. 93. Lost a loved one – Who hasn't? 94. Had a baby – Two. 97. Been involved in a law suit - Nope, thankfully. 98. Owned a cell phone – Sure do! 100. Ridden an elephant – No, but I'd try it! Time to play catch up! I had some publications in late 2008 that I never got to share, so here they are. 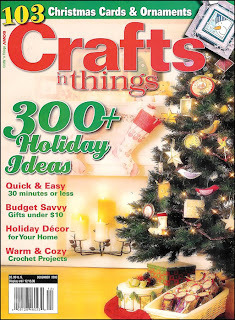 First up is the December 2008 issue of Crafts 'n Things magazine. I had five cards in this issue, all on the same page! Click the image below for a closer look. What's even cooler is that all five of these projects are available as step-by-step instructions online! 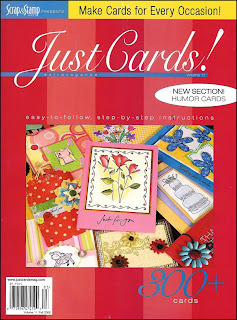 Just click the name of the card you want to view, and the instructions will open as PDF files. You may need to reduce the images for easier viewing. I also had four cards in Volume 11 of Just Cards! magazine. They are scattered throughout the magazine, so I'm going to skip all the scans. I didn't even know I was in this issue until a friend pointed it out to me. The magazine editorial staff accidentally left my name off of the list for mailing, so this publication came as a nice surprise! Ring in the New Year with Caardvarks! Here's our first challenge of 2009. The 'Varks designers were treated to a brand spankin' new sketch by the one and only fabulous Becky Fleck! Simply use this sketch and upload to the 'Varks Flickr group by midnight January 17th to be eligible to win a $41 value jam-packed kit by our sponsor, Studio Calico. Holy cow, is this prize awesome! My card uses some old and new products. 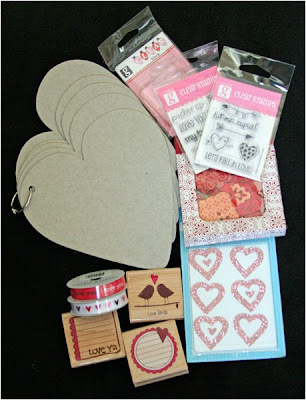 The paper and flocked flower are from the new Love Notes line by Little Yellow Bicycle. The fibers and silver embossing are about as old school as you can get! (Then again, if I don't post a project with fibers every once in a while, people are going to start to wonder if I'm feeling ok.) Click on the photos for a closer look. Details for this project are available by clicking here. 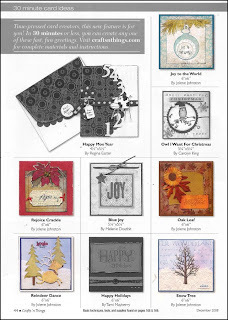 Can't wait to see the Flickr gallery fill up with your cards!